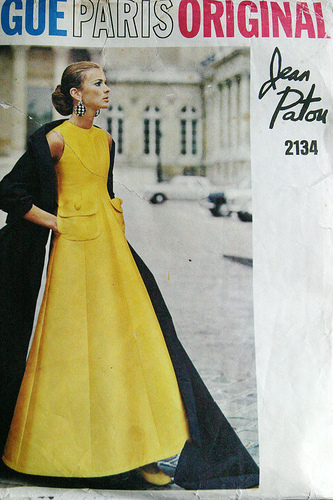 Has everyone seen this dress, from the PatternReview Vintage Sewing contest? Isn't it lovely? Shinta did such a great job — and she calls herself a beginner! Which just goes to show you: if you love a dress enough and take your time, even a beginner can make something exquisite. Don't settle for a ho-hum project; choose something that takes your breath away, then just concentrate. Slow and steady makes the dress. I think that even if this is the only dress Shinta ever makes, she can call herself a seamstress for the rest of her life. Seamstress First Class, even! Absolutely splendid! Yellow is not my color, however I think I would wear this in spite of it! Who’d be looking at my face anyway?! Breathless! Wow, that’s inspirational. And it looks like the Sew Retro theme of the month is “No More Buts,” including “but it’s too hard” – so your advice that you can tackle anything one step at a time is well-timed. Plus, such a nice way to get the larger, life-sized implications of this lesson, to get it not just intellectually but in your body. I bet Shinta feels unstoppable now, and she should!!! Fantastic work Shinta! You should be proud of yourself. A little bit of time and dedication and such an exquisite dress. It takes my breath away! No matter how hard I concentrated, I couldn’t do that! But I admire the people who can sew. Great job Shinta! Are you sure you’re a beginner? We’d love to see more of your work and hear more from you!!! Thanks for posting this great dress! I saw that one and said, “there is now no way in hell I’m going to win!”It is truly an amazing dress! Get on there and vote for Shinta! I think her dress looks nicer than the one in the photo on the envelope. That silk-shantung-y fabric is what makes it, I think. 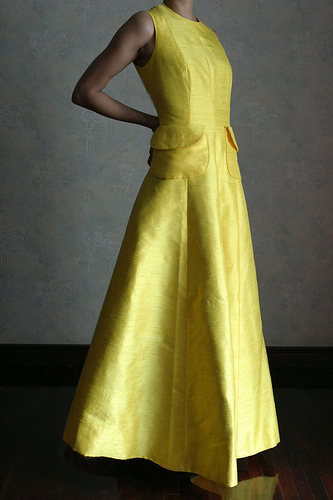 That dress is simply stunning, and I love the daffodil yellow color. She’s very talented, and humble too. Oh, well done, Shinta! *clapping*My mother used to say Chip, chip finishes the log; over the years, it has mutated into Stitch, stitch finishes the dress. The most wonderful dress you’ve ever seen, as well as the most scarifying hideousity, were both made the same way: one stitch at a time. You can do one stitch, can’t you? Then you can do another. Then you can put another in … and, sooner or later, you have a dress!Some en-Shantung evening, you may meet a straaaanger…. Great inspiration! I love the fabric she chose and I’m still hooked on yellow. Wow, that dress looks better than the one on the pattern envelope, and better on her than on the model!Nice work! That’s beautiful, Shinta! I love the pockets and the colour is fantastic! That picture made me gasp, it is so gorgeous. Shinta should be so pleased and proud, it is amazing.But I have to say, I kinda hate her – I’ve made more dresses than I can remember, and a few suits, and none have been remotely that beautiful. I don’t even know how you start putting in a zipper that pretty. Not to mention the fabric and lining selections, which are just – wow. wow, and wow. Wow, that dress is beautiful and she did a great job on it, but it doesn’t seem fair to the other contest participants to feature a dress on the blog here, esspecially if she wins. Oh, “anonymous,” get over it. People will vote for what they want.This dress — wow! I love the pockets. It may seem a travesty, but I want a shorter, more casual summer version. Now. Please? Anybody? I too am in awe of the dress.I’d also like to make a shoutout to Shinta’s photog. had she taken a picture of that dress on a hanger under harsh overhead light with a light colored background, it would likely have had half the allure. Sorry you want me to ‘get over it’ Tasha. No need to attack people, would you say that in real life?How would you feel if you had worked on a dress and entered it into that competition, only for the competition to get theirs features on such a widely read blog as Dressaday? I know I’d be really frustrated. It just doesn’t seem fair and I know life isn’t, but that doesn’t mean we should go out of our ways to make it unfair. And no, I didn’t post a dress in the competition, but only because I was too lazy to write anything up. Yes the dress is beautiful, but there are other beautiful dresses posted and I hope people will look at all the competition before voting. Anabolina, I understand your frustration, but since I’m not affiliated with PatternReview in any way (other than as a member of the site), I don’t see as there’s anything “unfair” with posting Shinta’s dress. (Neither do I know Shinta personally, so it wasn’t any electioneering on her part.) With any luck, posting it here will encourage people to visit the whole contest, which I also linked to. Okay, I just lost my comment… dunno why. So sorry if it does eventually appear twice. Anabolina, FWIW, I’m a staunch Dress A Day reader and I DO have an entry in the PR vintage contest. Obviously I am GUTTED that it wasn’t my entry that Erin picked out to praise, and will probably be mentally scarred for life 😉 but that dress is to her taste and it’s her blog so I don’t think it’s unfair or frustrating. C’est la vie!